Pinterest is removing the human element from Shop the Look pins, which let consumers learn more about the products that appear within a pin. 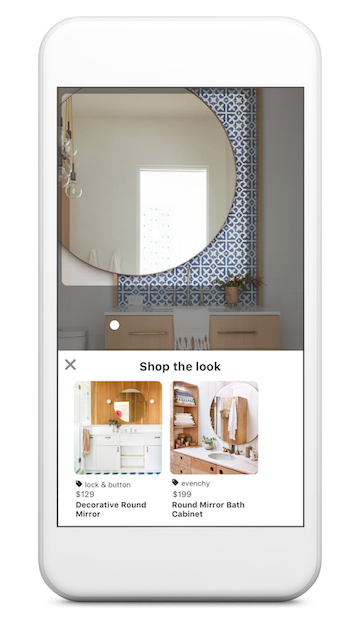 A Pinterest user can tap a blue circle on an element within a Shop the Look pin to pull up recommendations for similar items she can buy from a brand. For instance, if a pin features a model wearing blue jeans and a T-shirt, she can click on the jeans or the T-shirt. The move comes roughly two years after Pinterest first launched Shop the Look pins. However, until now, the tool largely relied on what it called a human-in-the-loop approach to match product links with pins. That meant that someone had to confirm the relevant products were within the pin. Now it is automating that process for home decor scenes on iOS devices, with plans to expand the functionality to Android devices soon. The implications of the move are substantial for brands because 97% of the 1,000 most popular searches are non-branded, which means they do not include a brand name in the search. And as Pinterest creates more Shop the Look pins, the system will tag organic pins that have not been linked to a business account. Brands that would rather not have their pins tagged can claim their domains on the social network. Over time, Pinterest plans to expand its automated Shop the Look technology to other categories.